OnLive for the iPad and a host of Android tablets officially launches with the arrival of the OnLive app and the Universal OnLive Wireless Controller. OnLive has officially announced that its cloud-gaming service will now be playable on the Apple iPad 2 and Android tablets like the Samsung Galaxy Tab 10.1 and the Amazon Kindle Fire..
Running over Wi-Fi only, gamers will be able to download the OnLive app from the App Store or Android Market where gamers will receive a free copy of Lego Batman to get up and running. OnLive will make 25 games available that will support touchscreen controls while additionally the Universal OnLive Wireless Controller also announced today, can be used to play the majority of the 200 games already available on OnLive which includes Batman Arkham City and Assassin's Creed: Revelations. We spoke to UK General Manager Bruce Grove who stated that bandwidth required to run OnLive on a tablet will be around 2-3 Mbps. Grove also revealed that an exclusive touch edition of Rockstar's LA Noire will launch imminently on the gaming platform. The OnLive app is free to download while the OnLive Universal Wireless Controller which connects via Blueooth or a USB dongle (supplied) is priced at £39.99, but has yet to be given an official release date. Current OnLive pricing for games remains with users only required to buy just one copy to play across all devices. 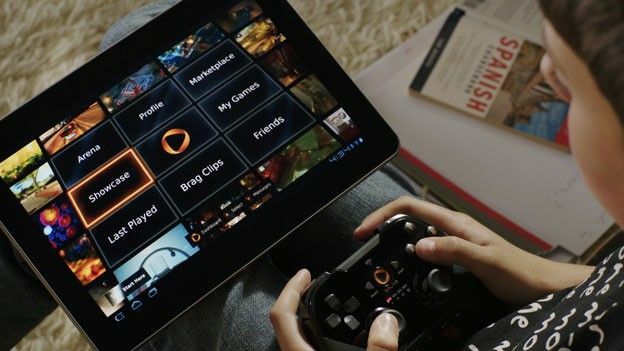 OnLive users in the US will be able to access the gaming platform on smartphones running 4G. Folks in the UK will have to wait until 4G launches before they can play Arkham City on a phone which might not be until some time in 2012. You can read our OnLive iPad hands-on review to find out if this really is the birth of PC gaming on tablets.